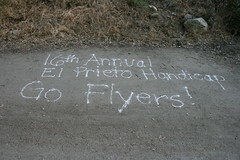 This weekend marked the 16th annual El Prieto Handicap – Chuck’s annual race. It’s a very neat event, held in the San Gabriel Mountains in an area called Oak Grove Park. Two miles of the race is on a single track trail called El Prieto (hence the race name), and every year the direction alternates: one year is uphill, the next year is downhill. We have to keep the number of registered runners below 75, otherwise the Forest Service would charge us. There’s no entry fee, and the handicap means that literally anyone, even the slowest runner on the course, has the potential to come in first place. The race starts consuming his time around mid-April when people begin to register in earnest. As it’s a handicap race, he has to enter people’s expected race times in his big spreadsheet to calculate their handicaps. About 48 hours before the start of the race he goes into high gear, marking the trail, gathering all of the race paraphernalia, making lists and checking them twice – that sort of thing. The night before the race he was up until about 1am doing last minute preparations. Phew! This year our friends Christine and Kyra helped him mark the trail and wrote lots of great messages for all the runners in flour for us to encounter as we ran. Very cool! Normally part of the race ritual included the design and printing of special t-shirts. But this year, after Chuck’s battle with lymphoma we decided to change things up and ask people to donate money to the City of Hope, in thanks for all they’ve done for Chuck and all the other many cancer patients who have gone there for help. Not getting t-shirts didn’t discourage anyone from registering, in fact we had a record turnout! 55 people turned up bright and early Saturday ready to go. This year we ran uphill. Personally, I like uphill much better. I always feel like I’m about to trip and kill myself when I run downhill on trail. Some folks prefer the downhill years; they like the craziness and speed of the downhill to the relentless slog of the uphill. The race winner pointed out a pretty common flaw with Chuck’s spreadsheet: people who haven’t run before and don’t give good race times end up getting really good handicaps and blow the rest of the course away – but that’s part of the fun; you can count on unexpected victories! The fastest time this year was 34:15, run by John Moss, a really good local runner. Post-race, a lot of folks gathered at our friend Valerie’s house for what we called a “celebration of life.” It was enormous fun and a wonderful end to a wonderful day. Our heartfelt thanks to everyone who shared the day with us and helped to make it very special. The really awesome news is that we raised almost $1900 for the City of Hope! Next year we plan on doing even better! Pics of the race are here. Pics of the party are here. Thanks to Skip for the super pics at the top of the El Prieto Trail and to Gerry for catching the runners at the bottom of the trail, and Maureen who took some great shots the celebration party. Keep me on the Prieta mailing list. I’ll come down for the uphill one. Very much fun! Thank you for doing this so many years. I’m thrilled with the cashola raised for City of Hope! 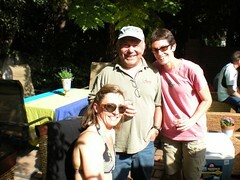 And, Valerie’s party was tremendous. Next year I’m bringing my bathing suit and I’m going to have a race off with Chuck! See you soon. Can’t wait to see the race! Chuck is ready.